A man puts his eye to a peephole. A woman smiles and flourishes her dress. Halfway through Phantom Thread, Paul Thomas Anderson’s new period drama about the relationship between a high-fashion couturier and his ambitious young muse in post-World War II London, Reynolds Woodcock (Daniel Day-Lewis) watches through a hole in the door as Alma (Vicky Krieps) models one of his new dresses at a fashion show. She feels his gaze upon her. Her body and the dress become one. Fabric and flesh become beauty incarnate and, for the man behind the door, the embodiment of a vision that had up until that point existed only in his imagination. In this single moment of an artist marveling before his creation, Anderson manages to capture all that is thrilling and gorgeous and sordid and exploitative about the cinema. Here is a man who crafts ideas out of people, a man whose celebrated precision, imagination and technical ability depend upon disposable beauties who titillate and then disappear. With one extreme close up of Woodcock’s eye drawn greedily towards the flickering light of the peephole, Anderson offers in a blink what Rear Window describes in two hours: that moviemakers and moviewatchers are distinguished by their voyeurism. And yet, the master stroke of Phantom Thread, as with previous Anderson movies like There Will Be Blood and The Master that are similarly anchored by domineering male “geniuses,” is that these men who present such an air of authority in fact have the temperament and discipline of three-year-old children. Every carefully composed image, every strike and counterstrike in the psychological warfare of the movie’s central relationship, mercilessly critiques the sorely abused privilege on which artists like Woodcock stake their success. No matter his talents, this man is toxic, and the society that reverentially celebrates his creativity also enables his noxious, infantile authoritarianism. For audiences looking for a sweeping period piece with grand drama, elegant romance, and broad historical commentary, Phantom Thread may be a bit of a disappointment. The movie hints at, but does not focus on, the rise and fall of the House of Woodcock, a fashion brand in post-war London that connotes class, refinement, taste, and authority. It gestures towards the collapse of an old order and the beginning of a new, the pending obsolescence of a larger-than-life artistic icon in the face of a new generation of Brits with little tolerance for the pre-war haughtiness of imperial couture. Instead, this movie focuses obsessively on a single relationship (well, perhaps on two or three, if you count Woodcock’s Oedipal obsession with his deceased mother and his absolute dependence on his stern, devoted sister). The movie asks: in a social and economic and aesthetic milieu that is so terribly tilted in favor of the man, no matter how priggish and beguilingly immature he may be, how does a woman craft a relationship with an equitable balance of power? Even better, how does she usurp the authority of her benefactor while still convincing him that to relent to her designs is really the only, not to mention the best, thing that he can do? Anderson, who is the movie’s writer, director, and cinematographer, conducts light and shadow, clothing and posture, setting and performance like composer Jonny Greenwood wields the movie’s intoxicating classical score. Here are the trappings of distinction: a grand house bustling with dutiful admirers and seamstresses and assistants; trips to the snow-capped Alps and idyllic British countryside by immaculately dressed people who craft rigorous beauty out of leisure. But beneath the glamour roils a vicious, gendered inequity that Alma recognizes and methodically works to undermine. With a tracking camera that never lets either of its protagonists out of its sights, the movie lures the viewer into a trance of gorgeous malevolence and deceit until all of a sudden the power has flipped, and the relationship, leveled, has oddly enough become something more sustainable. I’m not quite sure if Alma emerges as the heroine or the anti-heroine of Phantom Thread. But in an environment so spoiled beneath its glimmering veneer, whichever Alma is, she is exactly the figure whom the House of Woodcock needs and deserves. 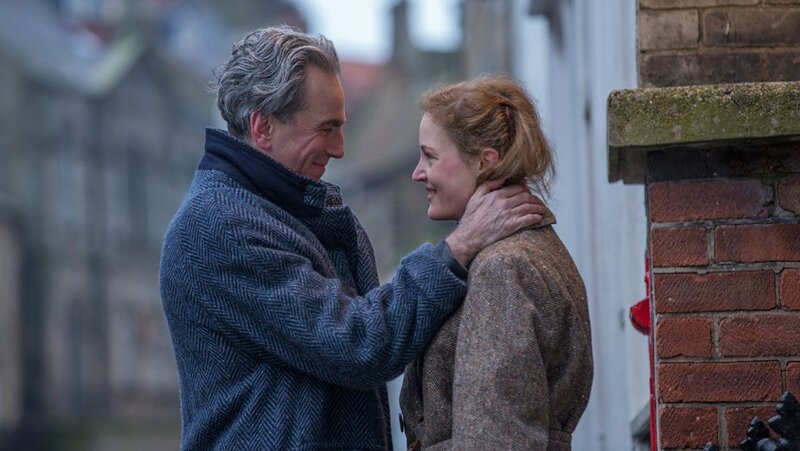 Click on the audio player below to listen to a review of Phantom Thread on a recent episode of WNHH's Deep Focus.